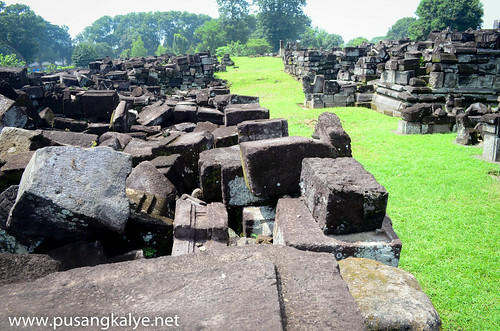 I got a few feedback from some travel bloggers that they visited Borobudor first before going to Prambanan Temple and they got bored with the latter. I always want to make sure that we save the best for last in our tours so we headed straight Prambanan Temple from Yogjakarta Airport. despite the lack of sleep. Imagine, 4 hours flight from Manila, 6 hours waiting at the airport, 1 hour flight to Yogyakarta, 30 minutes bus to Prambanan and barely 40 minutes of sleep along the way. But it was all good. For one, I was very thankful for the sunny weather. Remember that January marks the full swing of rainy season in Indonesia and we heard of massive flooding in many parts of the country a week before we came. The universe was kind to us. I imagined we will be going around temples in raincoat. It didn't happen. Thank God! 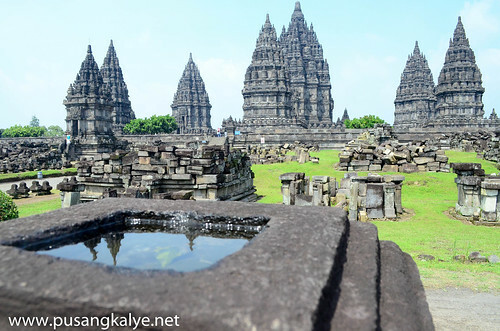 Prambanan Temple is a UNESCO World Heritage Site. 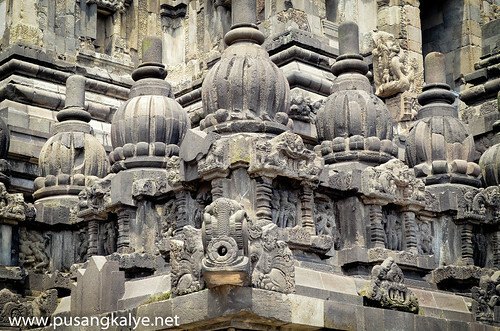 It is probably the most famous Hindu Temple in all of Indonesia. The place is old. And when I say old, I mean construction dating back 9th or 10th century. This temple is hundreds of years older than Angkor Wat. Wow. Just wow! We went straight to the Foreign Tourist Entrance to buy tickets. There is a small airconditioned building where you can buy tickets. Normal price is 198,000 Rupiah which is roughly $16. I find it a bit pricey for a single temple. I mean, Angkor Complex for a single day pass is $10 and there are countless temples in the complex that one day is not enough. If you are a student, bring your id. 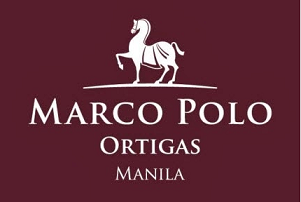 It will get you 50% Off the regular entrance fee. It doesn't matter where you study in the world as long as you are a student and you have your id. I think it is a UNESCO thing. 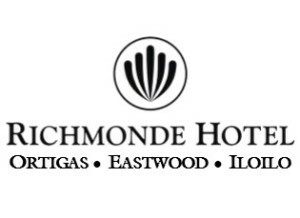 here are separate entrances for locals and foreigners because locals of course can enter at cheaper price. Sure we look Indonesian too but we don't know how to speak the language so we didn't bother trying the other entrance. If you have a local friend, you can ask him/her to buy tickets for you and you will surely smile your way in at half the price at 99,000 Rupiah. As a compliment, the Foreign Tourist Entrance Hall provides free coffee and has clean restroom where you can refresh so as you wouldn't look haggard for a classic Facebook profile photo. This is where "sarongs" arr also provided before they let you loose in the temple grounds. If you are coming in with your heavy backpacks, you are lucky, they have a package counter where you can leave your things for free. Yes, free! I was too excited to explore the temple and forgot to put on sunblock. Two weeks later, my body still has the mark of my sleeveless shirt. Haha! In many temples in Southeast Asia, dress codes are strictly observed, meaning, you cannot get in with your skimpy shorts and spaghetti straps so as to maintain the sanctity of the place. 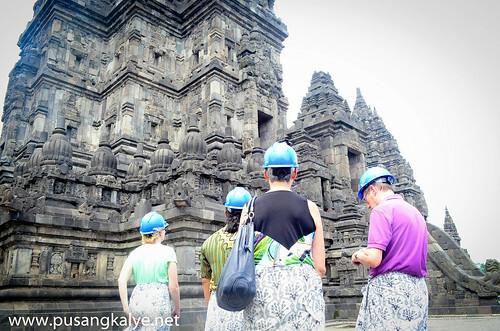 In Prambanan though, sarong are more of an accent, a fashion statement of some sort to clearly identify the place. 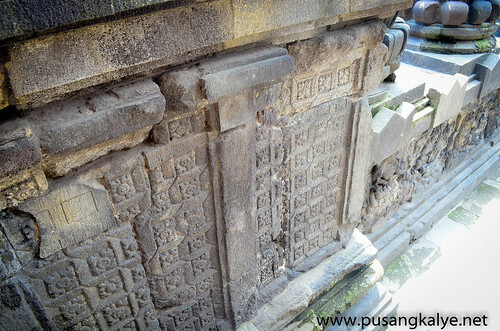 There used to be a total of 240 temples in Prambanan when it was completed. Today, around less than 20 are standing. Owe it to the reconstruction efforts.The three main temples ( Trimurti temples) dedicated to the three Gods: Brahma the Creator, Vishnu the Keeper, and Shiva the Destroyer.  are the most prominent. We explored the smaller buildings first. We didn't hire any guide so we were on out own appreciating the reliefs around the towers. Come early before the crowd flood the complex. Other than tourists, the place is famous for field trips where kids come in hordes and in most cases in their most colorful clothes. Haha! The central building/tower is dedicated to the Hindu God Vishnu the Keeper. It is therefore the largest and tallest of all towers. In the case of the central building, only 20 people at a time are allowed to go up and you are given only 15 minutes to stay in the temples. The ones at the entrance could easily control the crowd because you need to have a hard hat first before you are allowed access. There are only 20 hard hats available so you have to in the line until a helmet is available. I think it is not the case of rocks possibly falling on your head. I don't think the temple is not fragile after it reconstructed, if so, they wouldn't allow tourists to climb up. It's because of the fact the overhead rocks in many passages here are too low you will hit your head if you are not careful. I am short at 172 cm but I hit my head on some overhead rocks on several occasions. Imagine if I were not wearing helmet, but have really bumped hard. If Borobudor is famous for sunrise, Prambanan is well know for sunset and after dark. Imagine the towers take prominent shape before it gets dark. Also, opposite the entrance, a few blocks from the inner towers is a stage where the play "Ramayana" is staged at night with the lighted towers at the backdrop. You can enjoy watching the play while having a buffet. 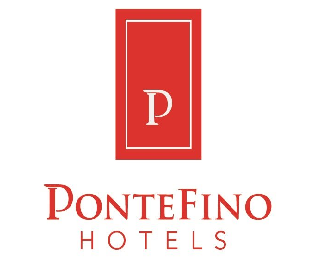 There are tours with different packages you can avail of so ask your hotel about it. I thought it would be a good idea to try it out but it was mostly rainy at night during our stay. I thought it is also a little expensive so the rain was the perfect excuse not to try it out. Would have been a nice experience though. 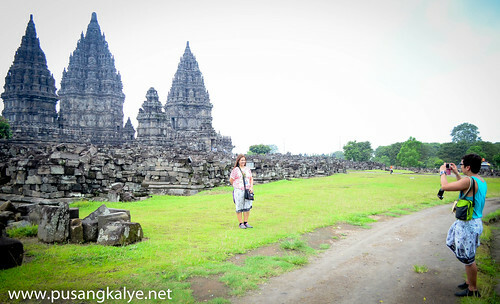 I don't really see the point in comparing Prambanan with Borobudor. Sure, both are old old temples but they are very different from each other. 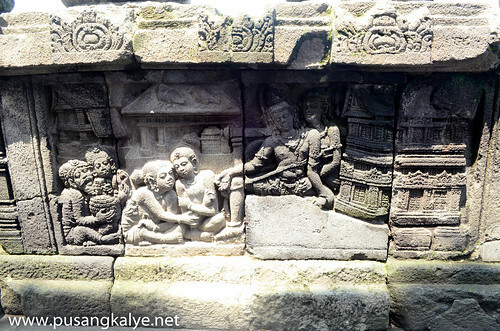 To start with, Borobudor is a Bhuddist temple while Prambanan is a Hindu temple. That in itself means each temple has distict architecture and therefore, different charm. 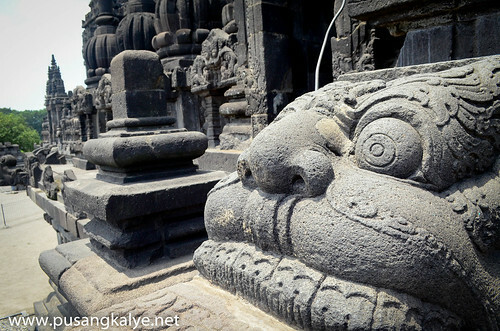 You will surely have your favorite when you visit both temples but for me personally, they are both unique. There's no competition. Another distinction perhaps is location. 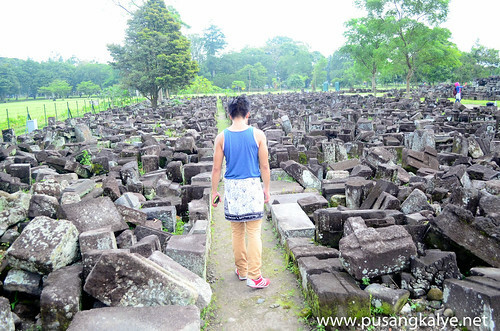 Borobudor was built on a hill while Prambanan is located on flat ground. Thag said, you get a better view of the sorrounding area ( the mountains, the two volcanoes and nearby vegetation) when in Borobudor. 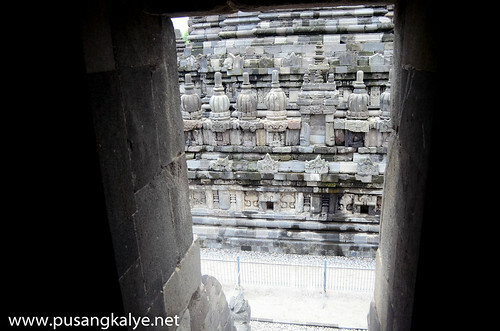 But Prambanan has a different charm. The fact that it is erected on flat ground makes the towers of complex a standout in the area. 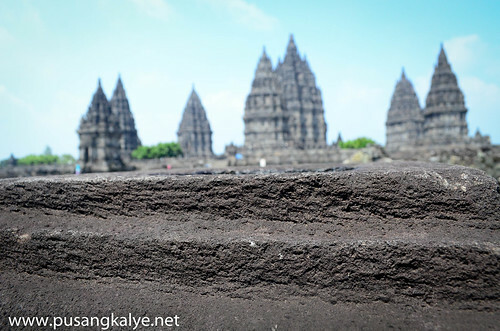 All I can say is that Prambanan is Postcard Perfect! Standard car tours are offered for Prambanan from downtown Yogyakarta so be sure to check the published rates at your hotel. If you prefer D.I.Y, you can rent a car, go by taxi or by TransJogja which is a bus rapit transit. Though a little more expensive, the most convenient is to go by taxi tour. 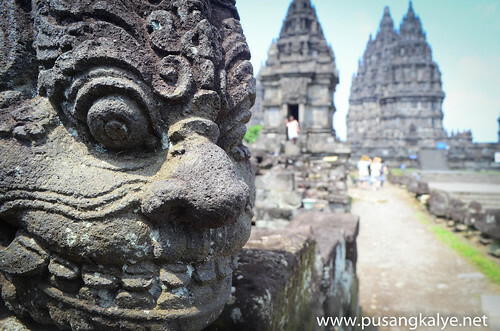 If you are flying in to Yogyakarta during the day, you might want to go straight to Prambanan from the airport as it is only 30 minutes away from there via Transjojga. 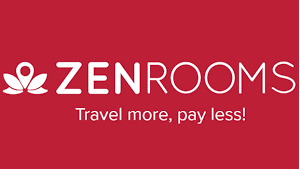 Cheap at 3,000 Rupiah and convenient because there are only a few stops from the airport station to Prambanan. Taking Transjogja is not advisable though if you are from downtown Yogyakarta . You need to understand that this bus rapid transit goes around town in loops so it will take around an hour before you get to the airport station and another 30 minutes from there to Prambanan. Waste of time. 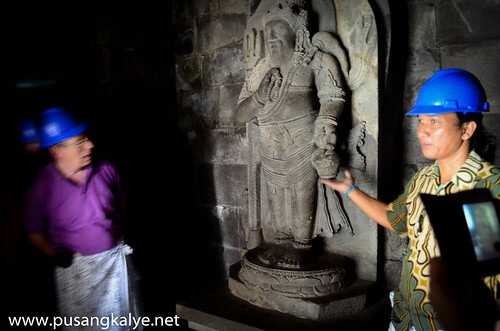 There is also a tour which offers sunrise in Borobudor Sunrise and sunset in Prambanan on the same day. 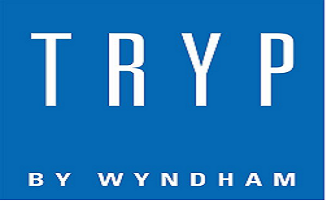 Perfect if you are visiting on limited time. I say, see both so that you will not regret later. 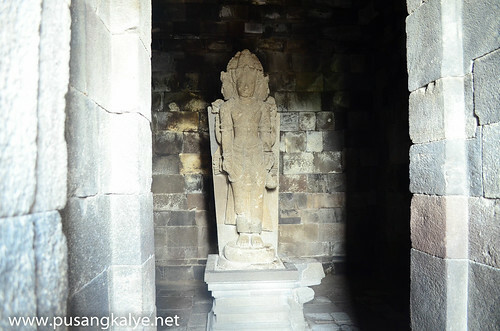 There are also a few notable temples nearby Prambanan Complex, the most notable of which is Candi Sewu which I heard is a Buddhist temple and is a little older than the former. Shame we missed it because we were all exhausted after going around the complex. Thanks to the hot weather and the lack of sleep. We had a quick lunch at one of the restaurants inside the compound and we were off to downtown Yogyakarta via Transjogja. 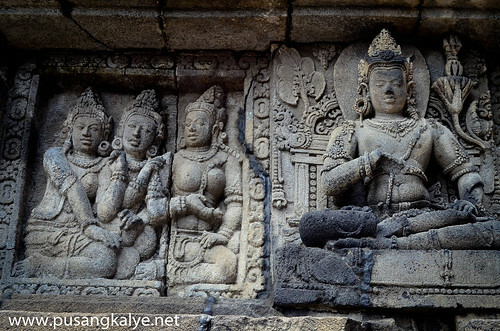 Yes, there is several notable temple scattered around nearby Prambanan Temple and surrounding area. 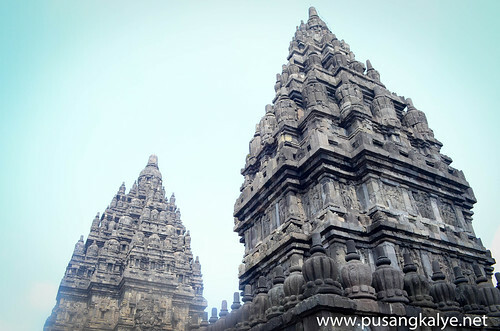 Sewu temple would be the notable one because its appearance reminds us of Mini-Borobudur. The other two, Lumbung and Bubrah might not be too interesting since it is half devastated and either not well finished reconstructed or it is left remain. 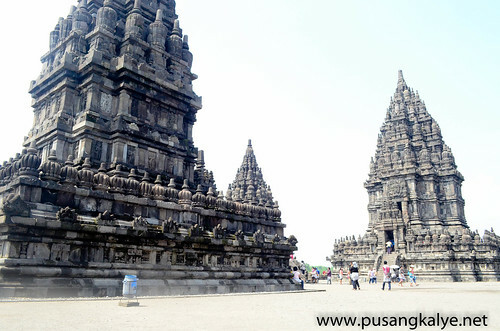 Surround area of Prambanan is very rich of scattered temple. 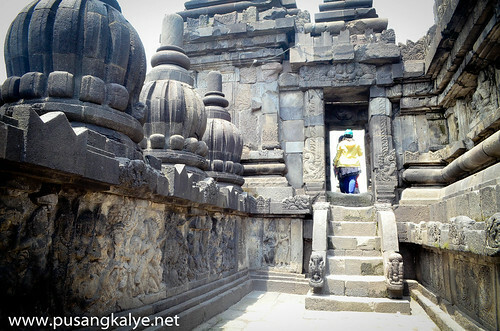 Should you open your map, there is Candi Kalasan, and many others little temple. Although it is not as big Prambanan, or Ratu Boko, or even Borobudur, but I think it is quote worth visit though.